Thomas Daniell (1749-1840) and his nephew William (1769-1837) travelled throughout India from 1786 to 1794 drawing and painting the landscape views and monuments they witnessed along the way. 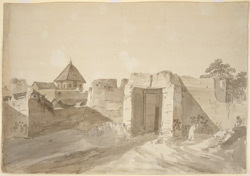 The Daniells are renowned for their Oriental Scenery, a collection of aquatints of views of India in six parts published between 1795 and 1810. Formerly known as Kalyanpuri, after the local deity Kalyanji, Karauli was the capital of a small princely state in eastern Rajasthan founded in 1348 by Raja Arjun Pol. Strongly fortified, the town is surrounded by a wall of red sandstone strengthened by several bastions and surrounded by a series of ravines. A peripheral wall with six gates provides an extra line of defence, although it is now mostly in ruins. A palace was built at Karauli by Arjun Pol but was superseded by the 18th century structure erected by Raja Gopal Singh in the Delhi style of architecture.